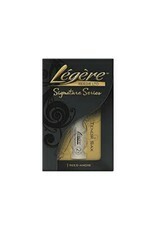 Professionals tend to prefer Légère's Signature Series reeds which produce a warm, rich tone in all registers. Signature Series reeds are made from a stiffer material and are cut thinner than our Classic reeds. These changes make the Signature Series reeds more flexible across the tip, producing a full spectrum of overtones and a beautiful sound with minimum effort. No matter which reed you choose you always get the same Légère quality and the durability Légère has become famous for.